Because you are going to be wearing them for most of the day, your boots should be comfortable, they must help you keep your leg and ankle fairly firm so that they work together when you want to move on the snow, but still allow your ankle some flexibility. Most importantly of all, your boots should hold your foot firmly in place. All boots are, basically, constructed in the same way with a rigid outer shell, and a soft inner that is removable. If you can afford them, the more expensive boots can actually be heat moulded to fit your foot; this makes them more effective, and comfortable. Now you’ve bought your new boots how do you get the best out of them? It is always a good idea to walk around the house in your new boots to ‘break them in’ before your trip – your friends will be impressed with your Frankenstein impression! Another good idea is to cut your toenails so that they don’t rub, and make sure that your socks are pulled on correctly – no rucking! Try not to over tighten your boots or to overdo the first couple of outings – if you bruise your shins, it will spoil your trip, because the boots will continue to rub. When you get on the chairlift you should loosen the boots if possible. Once you return to the hotel, remove the inners if they are wet or damp, and make sure that you leave your boots in a heated room overnight. Of course in order to ski, you need to have a pair of skis – however it is not a simple as taking any old pair off the rack, just because they are a nice colour and have great decals! Your skis should be an extension of your body if you want to get the most out of the Piste; so you have to take the time to find a pair that is suitable to your height and the type of skiing you want to do. Are you a beginner, intermediate or expert? Downhill or Cross Country? Racer or Slalom? When picking your skis, you should look for the same quality, performance and engineering as you would a car. Is it easy to turn in them? Do the edges grip well? Do they lose stability at speed? Are they the right shape? Do they absorb vibration? What are they like in different conditions? Are they forgiving? How heavy are they? Finally …. Do they look cool? So – we have the boots, and we have the skis, all that we need now is some contraption that will keep the boot fitted to the ski. Let’s look at bindings. Bindings are meant to hold your foot firmly to the ski whilst at the same time allowing your foot to come away cleanly in the event of a fall, or pulling the boot back to the centre of the ski should you manage to correct yourself and prevent a tumble. 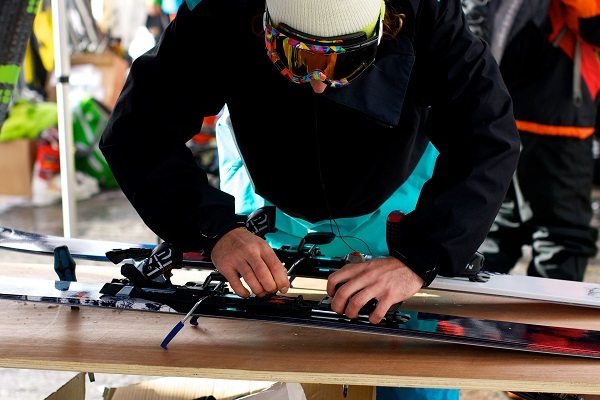 Like skis, bindings will differ depending on the type of skier you are. 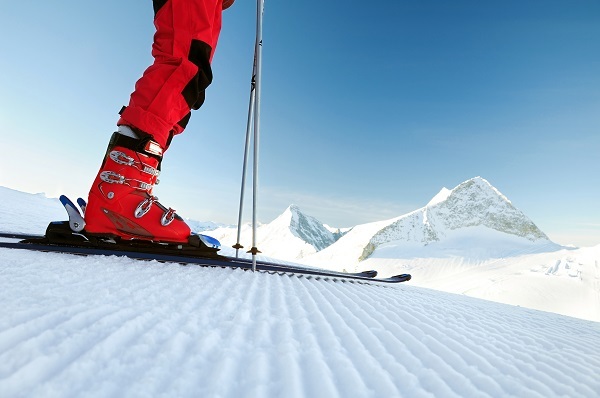 Heel-piece – clicks into place when you step into your skis and designed to open in the event of a forward fall. Toe-piece – the boot slides under this when you step into your skis, but it is designed to free the boot in the event that as you fall your foot twists. Brake – this is released when you step into the ski, and should engage when you come out of the skis (either at the end of your day or if you fall) this preventing the ski from careering down the mountain and injuring someone. How long should it be? Well, according to the experts if it is upside down and you hold just below the basket, then if you bend your knees slightly your forearm will be horizontal. To avoid having to keep going back for your dropped pole after a fall, you should ensure that the handle has a loop of webbing to attach to your wrist (a fall can be embarrassing enough without having to hunt around for a lost pole).